Title: Who R U Really? This was such a good book. Definitely will be passing this over to both my teenage niece and nephew to give a read. We live in such a tech-savy society this story fits right in to what happens sometimes to kids these days. Not only kids, but adults too. With social media being so heavy in our every day lives, we are constantly coming across people we have never met before in person. It's hard to tell if they are who they say they are or to even confine in them once you've been chatting with them for a while. A story that all of us should read because there are lots of people with online relationships, how can you really tell a person is who they say they are until you actually meet them? I don't want to give away too many spoilers, but I will say that this you can't let yourself easily trust strangers that you meet online. Not to say everyone is crazy and something bad will happen, but you do need to have your guard up in case the person you are communicating with isn't the person you think they are. This was a great read that opened my eyes even more about the internet. 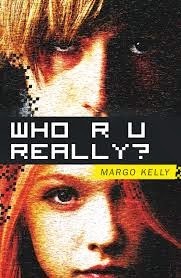 We are offering two of our Just Us Girls readers a chance at winning your very own copy of, Who R U Really by Margo Kelly. Leave a comment letting us know what you do to protect yourself when talking to people online on social media sites? Disclosure: All opinions are my own. I received Who R U Really? at no cost for the purpose of this review. No other compensation was received.